The need to keep devices' batteries charged, especially when on the road, has led to an explosion in growth for a nascent technology: mobile rechargeable batteries (MRBs). Often smaller than a pack of cards and able to carry enough juice to charge mobile phones, music players and tablets, via USB, these oh-so-handy peripherals are considered must-haves for anyone with multiple mobile devices. MRBs can be defined by the battery type, capacity, and output. Most commonly, they are either based on lithium-ion (Li-ion) or lithium polymer (LiPo) technology - the latter tends to be lighter and more flexible in construction. Capacities are quoted in milliamp-hours (mAh), with higher being better, and one can calculate a constant measure of energy known as watt-hours (WHr) by multiplying the mAh figure by the battery's voltage. For example, a laptop battery running at 11.1V and having a 4,300mAh capacity will produce a steady 47.7WHr. Do be aware that MRBs tend to define capacity solely by the mAh rating, though it's fairly straightforward to determine the WHr figure as most have a native voltage of either 3.6V or 3.7V. The better MRBs have multiple outputs - usually 1A and 2A+ - to enable concurrent, faster charging for multiple devices. Ideally, then, most readers are looking for a high-capacity, multiple-output MRB that's priced attractively. This is where Patriot steps in. Better known to you as a purveyor of memory and wireless-storage products, it has recently branched out into the heady world of MRBs. The FUEL+ range encompasses batteries ranging from 1,500mAh to 9,000mAh, and we have the biggest beastie on test today. Measuring 114mm x 93mm x 25mm (WxHxD), or about the size of said deck of playing cards, and weighing in at 189g, the £49 FUEL+ is a solid, well-built battery pack. Basic battery charge can be gauged by pressing the standby button on the left. Each of the four blue LEDs corresponds to roughly 25 per cent charge, so having, say, three lit tells you there's roughly 75 per cent juice in the unit. Speaking of which, a supplied micro-USB connector on the far side serves as the power input. This FUEL+ charges at 5V/1A when connected to a PC via a provided cable and up to 5V/1.5A from a wall-mounted charger (not included). The internal battery runs off 3.7V and with a 9,000mAh capacity the total continuous rating is a reasonably impressive 33.3WHr. Putting the capacity and power delivery into context, here are the WHr ratings for common mobile devices. Fortunately, as most MRBs use the same 3.7/3.8V as mobile devices, the mAH and WHr ratings can be substituted for one another. This means that, on paper, the FUEL+ 9000 can provide multiple charges to most modern smartphones, effortlessly charge a Google Nexus 7, and get a good ways into charging an Apple iPad Gen 4. Most cheaper MRBs have a standard 5V/1A output that connects to the device, but larger packs are usually equipped with higher amperage that facilitates faster charging. To this end, the FUEL+ 9000 has both 1A and 2.5A outputs on the front, and should you so wish, both can be used at the same time. Patriot has a nifty feature whereby the unit can be charged and also charge two connected devices at the same time. This is handy in instances where you need to top-up a tablet and smartphone while also charging the FUEL+ itself. From a near-dead state charging the FUEL+ to 100 per cent took around six hours when connected to a PC and about four hours when connected to a 5V/1.5A wall-mounted unit. In our first test we let an iPad Gen 3 (42.5WHr) tablet run down to two per cent battery and then connected it to the 2.5A output of the fully-charged FUEL+. 210 minutes later the FUEL+ ran out of juice. The iPad Gen 3, meanwhile, charged up to 62 per cent, leading to a FUEL+ efficiency of around 75 per cent - it provided 25.5WHr out of a potential 33.3WHr. Switching devices, we used the FUEL+ over a weekend to charge a Nokia Lumia 620 smartphone. The phone uses a 4.8WHr battery and provided little competition to the Patriot's largest-capacity MRB. The phone was charged four times from a near-dead state to full, with capacity left over to almost charge it a fifth time. Connected to the 2.5A port, the battery was completely charged in 50 minutes. Mobile rechargeable batteries have fast become big business. Patriot is hoping to muscle in on the segment with the well-built FUEL+ range, which tops out at 9,000mAh. It works just as advertised and can charge smartphones multiple times whilst providing enough juice to top-up most tablets. Dual charging ports and a 2.5A output are nice advantages not seen on many of the competition, but the street price of £49 may be one potential stumbling block; 10,000mAh MRBs are readily available for almost half the money. The technology's sound, so if Patriot can get pricing a little lower, the FUEL+ 9000 would become recommendation material. 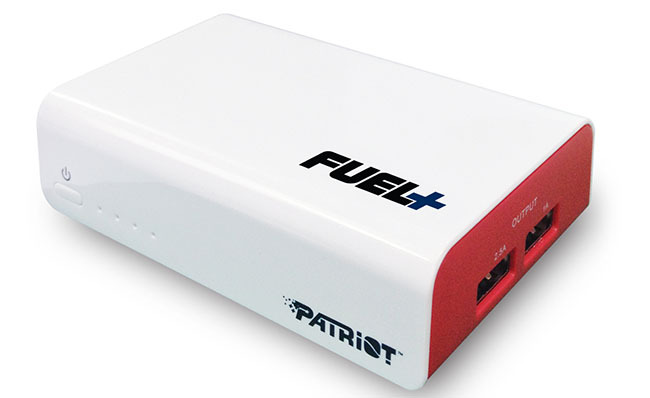 The Patriot FUEL+ 9000 is available from ebuyer.co.uk. At £50 it would be worth it at 90,000mAh. As it is, it's shockingly overpriced. i have a 20000mAh one that cost me £30 from amazon. It has 2 x outputs that share 2A and a single 1A output. Not impressed - got a pair of Anker Astro E4's about six months ago from Amazon, each with a 13,000mAh capacity (ie nearly 50% larger than the Fuel+). Cost about £30 each and came with dual ports (2A and 1A) plus an LED torch feature. There's probably “better” units out there now (although not this Patriot one) but the E4 comes with a good set of leads and a storage bag plus, best of all, it uses a standard micro-USB charger, so you can even top it up in your car. If Patriot want to sell the Fuel+ to me then the price needs a dramatic cut - £49 is way too much, £20 is top end for what I'd consider.